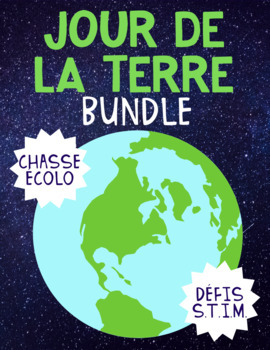 FRENCH Earth Day STEM Challenge / Jour de la Terre Défi S.T.I.M. This FRENCH document contains:A list of materialsA parent letter requesting recyclable materials12 STEM challenges of varying difficultiesA cue card to accompany the students' inventionsThe scientific process worksheetYou will find this document in my growing Earth Day bundle! A scavenger hunt activity for all grades (including Ontario curriculum ties, learning goals, a lesson plan and an exit ticket). A STEM challenge (including 12 STEM challenges, a list of materials, a parent letter requesting materials, and a scientific method worksheet).